Music has long been used as a force to command attention and raise awareness about issues affecting us as a society. Performers have the unique power to command an audience and bring people together, using their voices to unify communities and inspire them to rally around a specific cause. Younger generations, especially, look up to those men and women on stage who preach profound messages of justice, change and the power each and every one of us has to make a difference. Music, especially in our Northeast Ohio community, has had a lasting impact on our global culture, and this kind of influence begins with nurturing young talent to hone their skills, speak up and stand behind causes close to home. To nurture its growth, the seeds of change must often be planted locally. One organization making great strides in the betterment of our area is the Akron-Canton Regional Foodbank. The distribution center has changed lives in our area by building a collaborative network that gives out food and essential items to those in need and nurtures hunger-relief programs that allow the community to thrive. The Foodbank’s CEO, Dan Flowers, is using his voice as a performer to bring Akron-area children together for an evening of music and building awareness about the plight of hunger and what we can do to eliminate it. 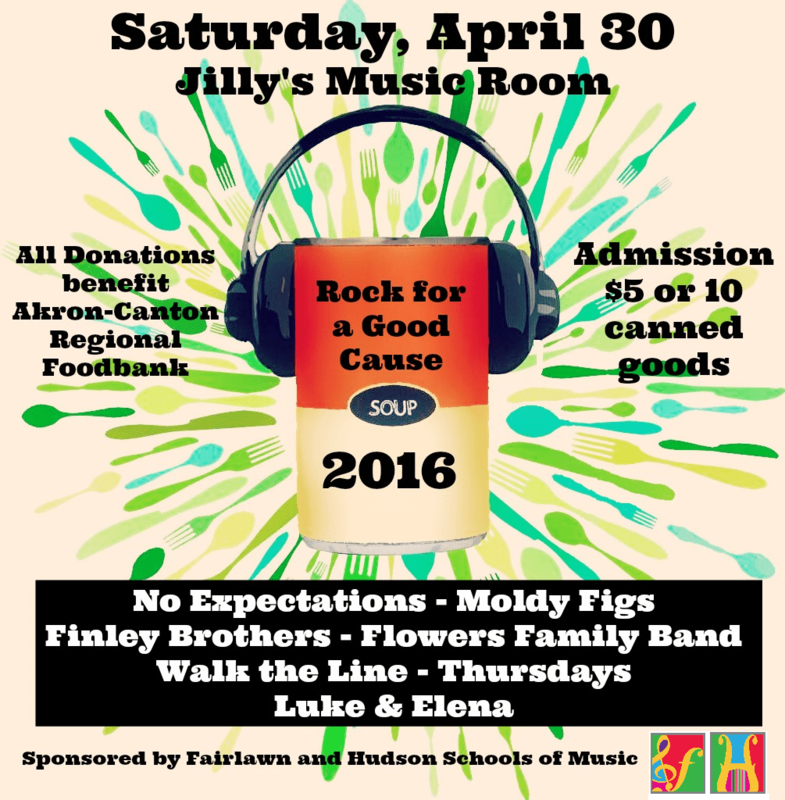 Flowers and his sons, along with an impressive lineup of students from the Fairlawn and Hudson Schools of music, will take the stage at Jilly’s Music Room April 30 from 1-5 p.m. to Rock for a Good Cause. The young musicians are encouraged to use their burgeoning skills and musical talents to make a difference in the lives of their peers. To participate in the event, students were asked to research and report on hunger in Northeast Ohio, says Kurt Reed, Director of the Fairlawn and Hudson Schools of Music. Participants were also asked to explore the important work the Foodbank does to help those in need. The event marks the 4th annual Rock for a Good Cause concert series, the mission of which is to raise awareness and serve as part of the Foodbank’s Harvest for Hunger campaign. The Fairlawn and Hudson Schools of Music are also hosting food and fund drives at their locations. Each institution operates on the foundation of personalized instruction toward performance. 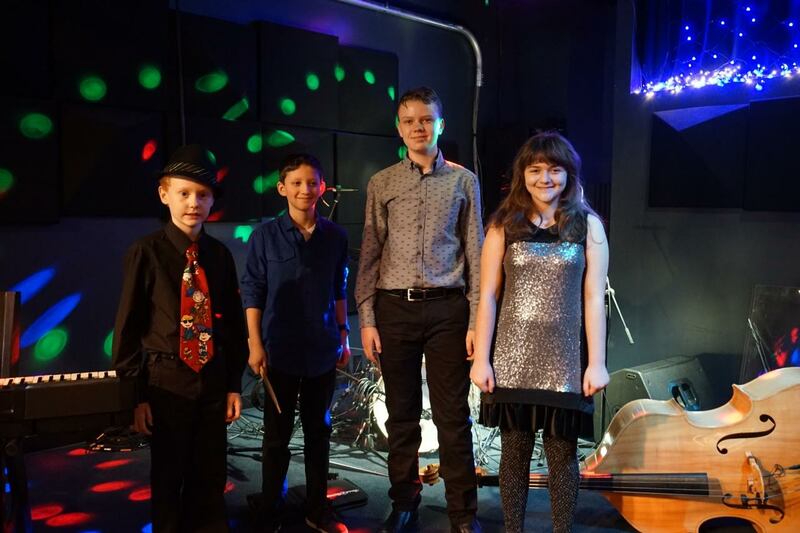 Established local musicians teach lessons to novice players in the area, offering a one-on-one approach that addresses the needs and goals of each student. Along with helping pupils learn how to play and perform an instrument, the schools have a strong focus on community, and they emphasize the impact music can have on our society. The schools regularly support charities like GriefCare Place, The Akron Dog Park and the Akron-Canton Regional Foodbank’s programs to stomp out hunger. “The goal is to raise $2,000 this year,” says Katie Carver, Program Services Leader at Akron-Canton Regional Foodbank. This monetary amount would be enough for the Foodbank to provide 8,000 meals to members of the local community. Admission to the event is $5, which is donated directly to the Foodbank, or 10 non-perishable food items. According to Reed, $1 equates to four meals for Akron citizens in need. More information about the event can be found online at fairlawnschoolofmusic.com, hudsonschoolofmusic.com or by calling 330.653.3676.